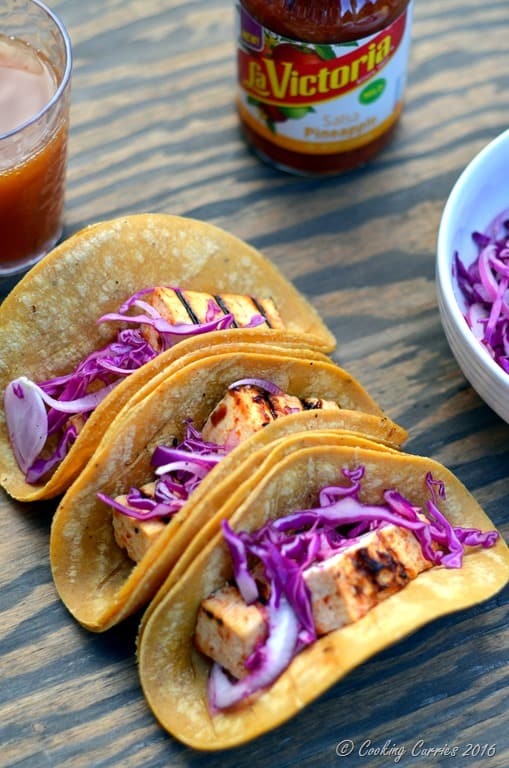 The sweetness of the corn tortillas carries through with the sweetness in the tofu seasoning and the pineapple salsa, while playing along the spiciness of the ginger and chile in this Sweet Ginger Chile Grilled Tofu Tacos with Pineapple Salsa. It will be a party in your mouth with every bite! Do you all remember the Ginger Tamarind Grilled Shrimp with Pineapple Salsa that I posted last month? Well, I fell in love with that La Victoria brand pineapple salsa that I decided to create some more goodies to go with it. I wanted to make something vegetarian with it this time around, so I can enjoy it too and not just let the husband and the kiddo devour it. The whole sweet and spicy thing worked really well with this salsa last time around and I wanted to play around with the same concept. I also love the tropical taste and feel you get with this lovely salsa that I added some ginger to my tofu marinade. 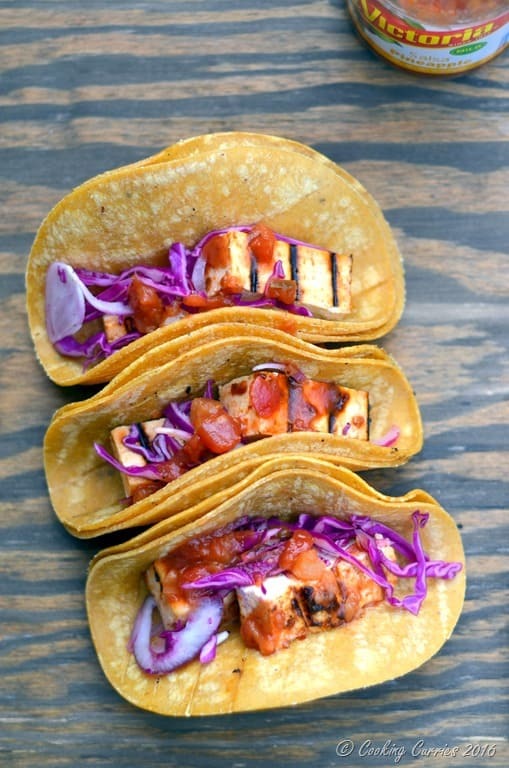 The earthiness and heat from the ginger along with more heat from the chili garlic paste and all that sweetness from the sugar in the tofu marinade and the pineapple in the salsa, just made every bite of these tacos a whole lot fun! 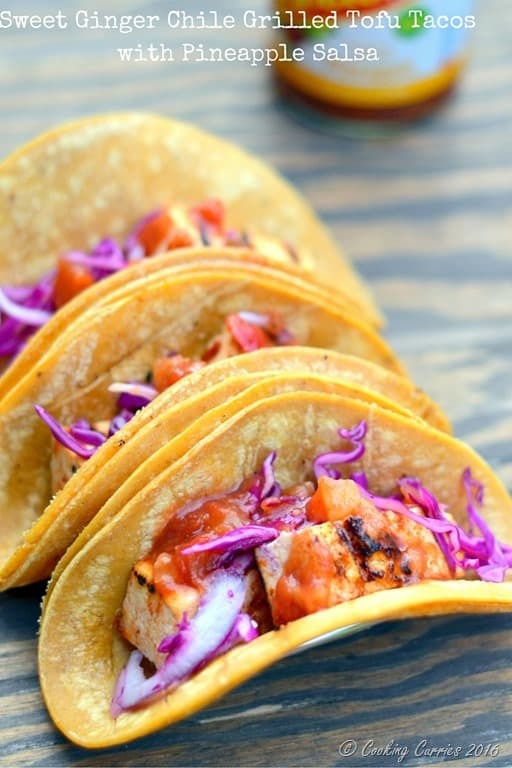 These tacos are also easy breezy to cook this summer. They are also great to pack away with you for a summer picnic. Just mix in the ingredients for the marinade, cook it a little on the stove top, add the tofu cubes in it, heat up a grill (stove top works fine) and grill the tofu cubes. While that’s happening, pickle the onions and purple cabbage in vinegar. Heat up the tortillas on the grill as well. You can pack up all these components separately with the La Victoria Pineapple Salsa and assemble when needed or put it together right away and dig into it, if you cant wait. Enter the Flavor Seekers giveaway for a chance to win a trip for 2 to San Diego (flight and hotel included!) Follow the link here for details and enter by sharing to Instagram or Facebook. Drain the water from the tofu. Press it between two sheets of paper towels and drain well. Cut into 2x1x1/2 inch slabs. Mix the chili garlic paste, sugar and water in a small sauce pan and bring to a boil and then simmer for 3-4 minutes till it thickens. Brush this marinade over the tofu slabs on both sides and keep aside for 5 mins. Heat a stove top grill and brush the oil on it. Place the tofu slabs and grill once on each side for 2-3 mins each. Grill the corn tortillas as well. Meanwhile, add the vinegar, salt and pepper to the cabbage and onions and pickle them quickly. Cut the tofu in half lengthwise before assembling – we keep the slabs bigger to keep the tofu from falling apart while grilling. Assemble with a few pieces of grilled tofu in each tortilla, topped with the pickled veggies and then some La Victoria Pineapple salsa. Did you know that the La Victoria brand of salsa came in other fun flavors like Mango Habanero and Roasted Pepper. 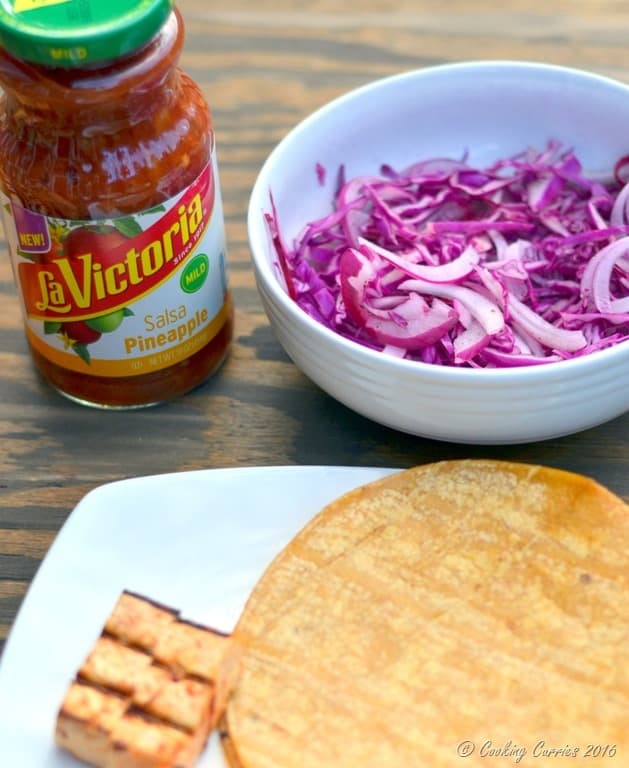 Visit the La Victoria website to follow our flavor journey and get more delicious recipes. Find sweet and spicy tips, perfect for summer grilling! Also don’t forget to Enter the “Flavor Seekers” giveaway for a chance to win a trip for 2 to San Diego (flight and hotel included)! Follow the link for details and enter by sharing to Instagram or Facebook. O how delicious are those flavors! Love some sweet and heat! OMG, YUM! I love everything about this!! Pinning! I love tofu tacos, and this new salsa is so delicious! I can’t wait to try them. Pinning! Those colour! The cabbage looks so pretty against the taco shells. They sound delicious too! Thank you Mel! They were delicious! ? I just love how adding 1 simple ingredient can completely brighten up a dish. That purple cabbage just makes those tacos “pop”! These pictures are fantastic. I love that you used grilled tofu. I always want to incorporate more vegetarian dishes into my week, I will keep this one pinned! It was indeed a party in the mouth! I tried this out. The flavours came out wonderfully well! These look delicious. I love all of the flavors going on in this recipe.